IMUSA Chinese New Year Steamed Veggies & Pineapple Sweet and Sour Sauce Recipe | Exploring Food & Drink in D.C.
Now, if you were one of those people who promised themselves to eat better and decidedly drop that “Freshman 15″, mommy pudge, or beer gut, we’re saying Chinese New Year is the time for that second chance. Chinese New Year is February 19 this year, so we’re sharing IMUSA‘s Steamed Veggies and Pineapple Sweet and Sour Sauce Recipe for all you who aren’t getting enough vegetables in their daily diet. At the very least it’s healthier than the take-out sweet and sour chicken, or lo mein. Although check out IMUSA’s steamer basket . We need this. We’re having dreams of dim sum, and steamed fish, pot stickers, and and and…. 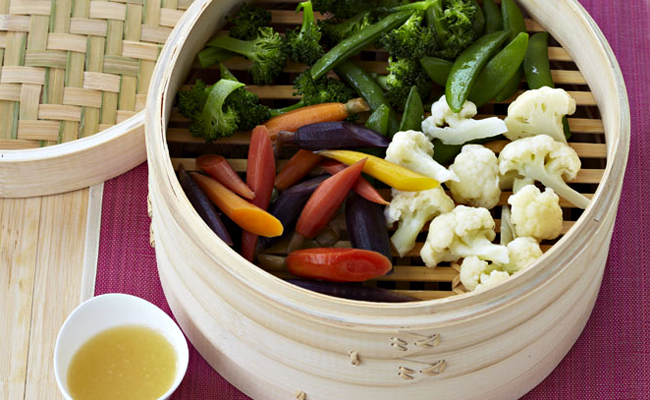 Tags: Chinese New Year, IMUSA, Pineapple Sweet and Sour Sauce, recipe, Steamed Vegetables, Steamer Baskets. Bookmark the permalink.